Family lore and Y-DNA testing recently chiseled a crack in my patrilineal brick wall, casting light - a piercing emerald green blaze - on the origins of my paternal ancestry. I learned that my paternal ancestors - the Kirks - were originally Quirkes from County Tipperary in southern Ireland. The Quirke surname was Anglicized to the phonetically similar Kirk when my branch of the family migrated to Scotland before journeying onward to America. Learn more about this saga in Surname Evolution: A Y-DNA Journey From Ohio to Ireland. After reassembling this forgotten history, I was drawn to the homeland. I had to see the landscapes and walk where generations of my paternal ancestors lived and died. I flew to Ireland at the end of August for an Emerald Isle homecoming. Thanks to the efforts of a distant US-based Quirk cousin, I was connected with an Ireland-based Quirke cousin. We corresponded over email and agreed to meet in the town of Cashel in the shadow of the famed Rock of Cashel - the seat of power for the kings of Munster. My Irish Quirke cousin picked me up at my hotel. I hopped into the front passenger seat and we set out on a driving tour of the county - passing through the townships that had been home to centuries of our paternal ancestors. As we neared his village, he turned onto a narrow road that could barely accommodate two cars. Towering hedges lined both sides of the road. "Welcome to the back end of nowhere," he quipped in his wonderfully charming Irish brogue. We drove past his home and approached an open patch of farmland paved with the stubs of recently harvested barley. Unexpectedly, we pulled forward. The car bounced and bumped as we worked our way across the width of the field. Startled jackrabbits bounded into running sprints and flocks of birds spiraled into upward flight. The car slowed as it pulled alongside an old stone wall that guarded the perimeter of the ruins of a small church and its graveyard. We climbed out of the vehicle and walked through a metal gate that cringed and cried its way open. Trudging across grassy clover, we came to a row of tall headstones. They belonged to generations of the Quirke family, dating to the 1800s. As I began to photograph the markers, a light rain gained momentum. We huddled under a large evergreen for protection. As quick as it had started, the shower subsided. It's a humbling experience to walk land once home to my ancestors, surrounded by stones commemorating the lives of relatives, and meeting my Irish cousin. Although our shared paternal ancestor is unknown and likely to remain so, I imagine he was smiling over his two progeny reconnecting despite an ocean and centuries of history between them. "Few are wholly dead: Blow on a dead man's embers and a live flame will start." Love your post and your ending quote! Thanks, HoneyBee. It's one of my favorite family history quotes. It speaks to the work we do as genealogists. I like you have also just returned from walking in the footsteps of my ancestors also in Tipperary. I had yearned to make this journey and found it so very fulfilling. It's an incredible experience, isn't it? I'm glad you had the opportunity, too! Many will enjoy your well written story and wish that they too could make such a wonderful trip. It is an incredibly rewarding experience that I hope all family historians can have. 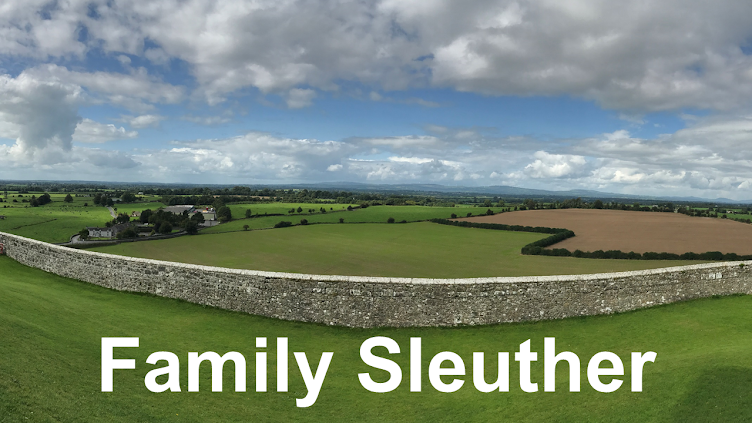 Mary I certainly enjoyed his descriptive account and although I'm in Ireland, I also got a great thrill visiting Tipperary Town to walk the ground of my ancestors. Lovely story. Thank you, Brilind. I appreciate it. What a wonderful quote! Your post moved me, having just made my own journey to my ancestral towns in Germany. Doesn't that sensation of walking where they walked just grab you by the heart as if out of the blue? It's remarkable. Yes, it very much does. In an odd way it almost feels like you're home. Love this post! I hope to do the same too and walk the steps of my ancestors in Ireland. I've been incredibly fortunate to have done it in Europe, twice! It's an amazing and moving experience that I wish for all family historians.